Email encryption with Microsoft Outlook can be difficult for sender and recipient alike to configure. PDF Postman offers a simple solution that secures the Outlook email message and file attachments, and can be easily decrypted by the receiver. Most people are unaware that the extremely popular and widespread PDF (portable document format) specification includes the ability to encrypt and decrypt using strong AES-256 bit encryption, Another secret of the PDF specification is that files can be "embedded" within the PDF, making it possible to extract the file from the PDF and edit it. 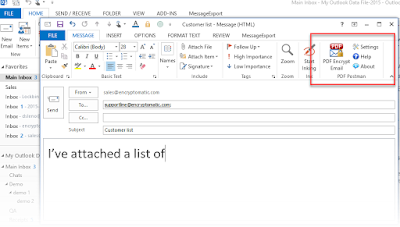 PDF Postman is an add-in for Microsoft Outlook that has joined these capabilities and applied them to sending secure email messages. Because Microsoft Outlook is the communication and work context for millions of people, PDF Postman improves productivity and security by making it extremely simple to compose and send a secure message. Once installed, PDF Postman appears in the toolbar in every time you want to send an email message. PDF Postman relies on password encryption. The password you and the recipient agree upon is used both to encrypt and decrypt the PDF document. While this is less secure than PGP encryption which relies on exchanging public keys and maintaining a collection of private keys, it's simple, safe and effective in the majority of situations. Sending an email and files in an encrypted PDF file means that a recipient with the password can open the encrypted file on virtually any device, with any standards compliant PDF reader, such as Adobe Reader. In most cases, this is something that the recipient already has if they are able to view PDF files on their Android/iOS table or phone, or any other device. To send a message with PDF Postman, click the "PDF Encrypt" button, and then "Send" the email message as you normally would. If a password is required, PDF Postman will ask you to enter it. Passwords are then associated with recipient email address for future use. You can change the password for any recipient as often as you wish. The process of opening the encrypted PDF file is simple for the recipient. They select the PDF file, and their PDF reader immediately recognizes the file is encrypted, and so prompts for the password. If the correct password is entered, the contents are displayed. PDF Postman works with an unlimited number of Outlook email addresses, both for sending and receiving. There are not additional charges or costs associated with multiple sending accounts. PDF Postman is a good fit where you are primarily sending to a limited number of recipients who do not need to send emails back to you. If you are sending an email to multiple recipients, then everyone in the group will need to have knowledge of the password. 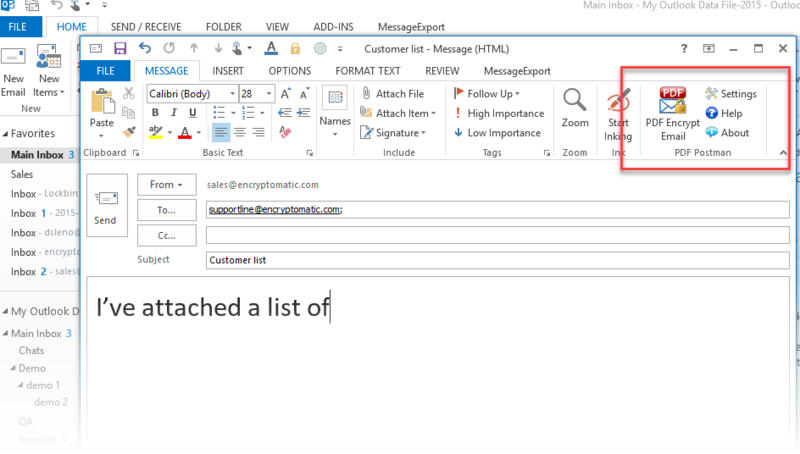 If you require an Outlook add-in that provides a way to receive messages from recipients, we also offer a service called Lockbin that handles sending and receiving very effectively. Use PDF Postman free for 15 days! After the free rial expires, leave PDF Postman installed! You will be able to send five encrypted PDF messages each month. PDF Postman in an email encryption add-in for Microsoft Outlook that uses the PDF format to encrypt your message. This makes it easy for recipients to access your message, provided they know the password. Though PDF Postman was designed to be simple to use, that doesn't mean we don't provide support and assistance for our customers. Here are the best ways to find answers to your questions about PDF Postman. Easily send encrypted PDF emails from Microsoft Outlook to Gmail and other email clients.